Discussion in 'Effects, Pedals, Strings & Things' started by theanalogdream, Apr 12, 2016. 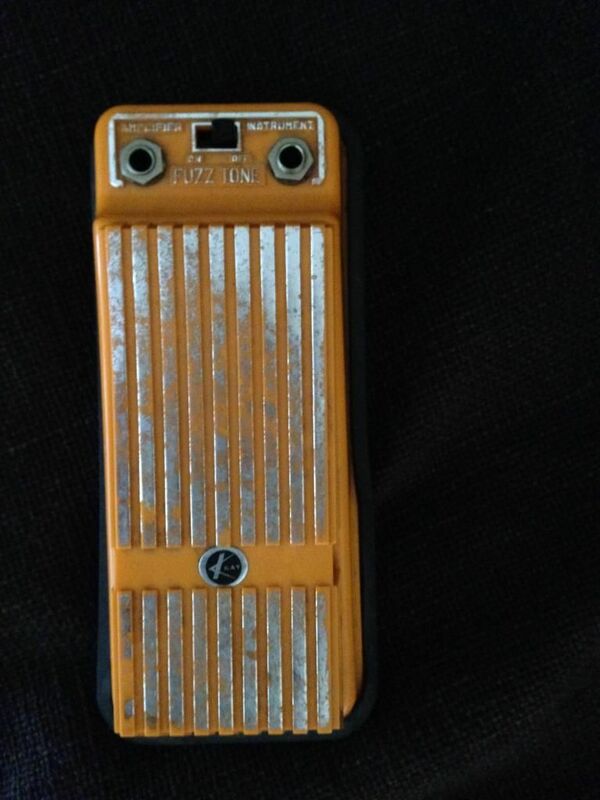 I've read a bunch of threads on here about the Orange Kay fuzz. I love Lanois, and I love the tones he gets out of these things. I'm thinking of something like the end of "Jilted Lovers..." on Brandon Flowers Lanois produced album. People seem to come down to Basic Audio and Creepy Fingers- both seem like great options. Are there any other contenders out there I should be looking at? If you have one, post a pic! I'm still getting to know mine. It is a gnarly beast. I dig it so far. Ezzy911, wrightdude, friend33 and 4 others like this. friend33, theanalogdream and la noise like this. In 1995 I bought a mint condition SF Champ with manual and orig cable for $100 and the guy threw in a Kay Fuzz that didn't work. I soldered one connection and it worked fine. Best deal of my life. jimbugg and la noise like this. How do you like the Black Cat, Flatscan??? Had one here as part of a BA tourbox and it had deliciously massive sound. Like a big stack of ...stackable big things! Here's my DIY version from back in 2007. I like it so far but need to spend more time with it. This should happen in coming days. I want to avoid strong public comments at this stage. friend33 and la noise like this. Someone should make one in like a mojovibe type enclosure with a big knob to control the sweep! I like the way type enclosure, but don't think I would dig it on a board. Keep them coming- so far, no creepy fingers represented. Non-Digital Tom, splatt, friend33 and 4 others like this. Black cat will custom make it for you. Following up per @la noise's question, and after substantial testing, I'm ready to give the Black Cat Kay fuzz an enthusiastic endorsement. The pedal is a huge amount of fun to play through. * The pedal stacks unbelievably well into the Tronographic Boxidizer (as do many). I also tried stacking into the Catalinbread SFT, the Mulder X-1, and the Fuzzrocious Demon (OCDish). The "best of the rest" was the SFT. * I mainly use the pedal in its "K-Fuzz" configuration and found the other diode settings less usable; I'm still exploring here though. * The gain knob is helpful. *** Basic Audio pedals that I switched back and forth between the Kay include the Wildcat, Zippy, Mutant, and Spooky Tooth. I wonder if John has ever made one in a Wah enclosure? the original treadle seems to manipulate the bias of some internal transistor, afaict, ¿no?, forcing the octave/etc to pop (or, hide). Flatscan and la noise like this. i def wouldn't want that.